In just a few months, the Toyota Innova has taken the market place by storm, adding nearly 10,000 new customers every month. It's an unheard of number in the MPV segment, and it's making even more news because the bulk of those sales comprises the top-of-the-line automatic variants that are flying out of the showrooms. So for Toyota that is a very encouraging sign after the recent NGT debacle that had affected them the hardest. Moving on from the Innova which has now settled into its rhythm, Toyota has now set its sights on the SUV segment and is finally back with the new Fortuner. This full-sized SUV was also one of its bestsellers, raking up numbers that were quite the envy of competitors. I personally know enough people who opted for the Fortuner simply because of its bold stance and bolder abilities to head out almost anywhere into the wild outdoors in any environment. Its versatility raked up quite a following, from weekend driving enthusiasts to politicians, and more. In no time, it became the symbol of affluence and power, even though it never really looked the part. Things have now changed - the new Fortuner is now more in sync with that aura of power and affluence it dispersed over its owners. It looks rich without a doubt; it looks posh, expensive and like a million bucks! Gone is that veneer of rugged handsomeness, it has now been replaced by a sophisticated, well-groomed appearance. 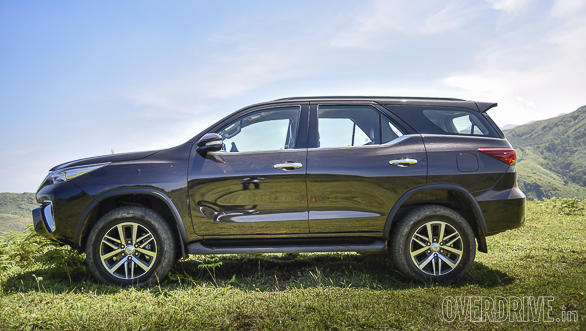 Here then are the top things you must know about this new Fortuner, a mix of all that is good or could have been better in the new Fortuner. 1. The new Fortuner's story begins with Toyota's aspirations to give this bestselling brand the pedigree of its larger, more premium sibling, the Prado. It is based on a common platform shared between the Innova, the Hilux pick-up and the Fortuner, but it shares more of its DNA with the larger, more capable SUV. This allows the Fortuner to enjoy a more rigid, better balanced chassis along with a more rugged suspension package that is much better than its predecessor both on-road and off-road. 2. It still stays true to its body-on-frame architecture, which has been improved compared to the older version if your aim is to be a great package in tough off-road conditions. But what has changed dramatically is the way it feels in urban areas more than what it can do in the wild. The ride quality is improved significantly, body roll is subdued thanks to a stabiliser bar at both ends and it feels more confident when pushed hard on tarmac. Double wishbones can be found at the front and a four-link coil spring configuration at the rear (Australian models get a plusher five-link configuration). It devours potholes of all sizes and simply steamrolls them without a second thought. At the same time, the suspension feels solid, though there is slight high-speed reverb when you drive across rough surfaces which you could also feel on the older-gen SUV. 3. What I did not like is the amount of understeer this SUV now has and the immense lack of steering feedback. Going for a completely electric steering set-up has damped the feel considerably, and it's hard to judge what the front end is doing in certain circumstances. Over and above, the turning radius even at 5.8 metres does not feel impressive either, something I experienced on a tight off-road course in Vagamon, a tea estate near Cochin. 4. A strong and much improved area now is the braking. Throw the anchors into the deep end and the Fortuner comes to a complete halt without any theatrics, but more importantly without that front-end dive! On the brakes it stays flat throughout, and that new behaviour is going to light up some faces! 5. The 4x4 capability has improved; by how much, I'm uncertain at this point since there are still several more tests we have to run the Fortuner through. The new Fortuner though gets an electronic shift on the fly drive selector dial which is simpler to use than the older shift lever. However, the procedure to engage 4-Low remains the same - stop, shift into neutral and then engage 4-Low. 6. The Fortuner's off-road prowess is enhanced by an improved rear diff-lock. Again there is no rear LSD, instead what the new Fortuner gets is an electronic system dubbed Active Traction Control (A-TRC) that behaves in a manner similar to an LSD. A-TRC essentially uses braking control to reduce wheelspin by braking individual wheels. 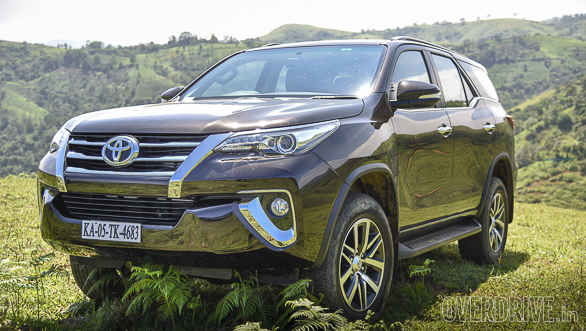 There's also a host of traction and assistance features, all aimed at making the new Fortuner a highly capable vehicle in a variety of conditions. Interesting bit is that when you twist the drive selector into 4-Low, all electronic aids switch off, giving greater control of the vehicle to the driver. 7. In 4WD high mode, all electronic aids are enabled, but vehicle stability control is subdued to allow more slip when needed. In 4WD low, all aids except A-TRC are switched off. If you need further control, holding down the VSC button for three seconds will further switch off A-TRC. 8. 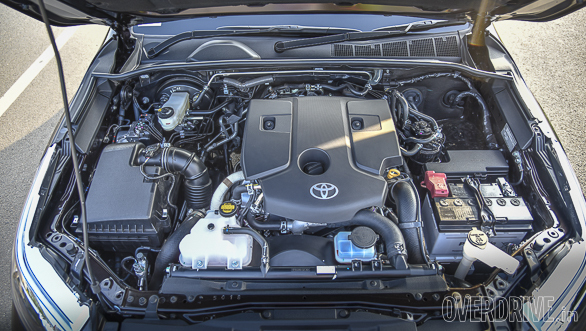 The Fortuner's diesel engine, which is the same engine used in the Innova, is clearly the choice to opt for. This 2.8-litre direct-injection, turbocharged diesel makes a 177PS of max power with 420Nm of max torque in the manual transmission version and 450Nm in the automatic. This engine has been worked on heavily to lower the NVH, and impressively even with the hood open and my ear to it, this has to be one of the quietest diesels I've ever heard. With improved efficiency and a more robust turbocharger, the new Fortuner's smaller diesel engine than its predecessor turns out to be more powerful across the board. Of course, I'm expecting better performance as well as fuel efficiency, but again only a test will reveal the full spectrum of its abilities. In my opinion, those looking for better driveability should go in for the 6-speed manual transmission. However, the 6-speed automatic with the paddle shifters isn't a bad option either if you are going to stay confined to the concrete jungle. 9. The Fortuner has two drive modes - Eco and Power. The former is supposed to provide better efficiency when driving in urban areas while the latter is supposed to provide a complete torque blanket when you need it. 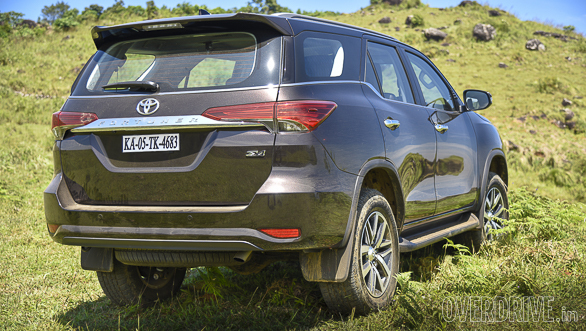 However, toggling between either modes did not make the Fortuner behave differently at all! Neither did the shift point change or the manner in which she responds to throttle inputs alter. I guess only a test will reveal the differences. 10. The 2.7-litre petrol Fortuner, I doubt even the sales people at the Toyota showrooms are going to encourage you in that direction. It's an engine that, let me put it simply, is there just to keep Toyota's interests alive in the Indian market when the chips go down again. They certainly don't want to be caught with their pants around their knees ever again, and this ages old petrol mill is there in the new Fortuner simply to fill in a gap if a gap spelt 'NGT' arises. It makes a 166PS of max power and 245Nm of max torque and is coupled to a two-wheel drivetrain alone. I drove the automatic variant, and it felt sluggish, noisy and rougher than the diesel. Obviously, Toyota's motive is to promote its diesel technology which it has invested heavily in, namely the new engine plant. 11. One oddity I also observed was with the kick-down in the automatic transmission diesel Fortuner. Using the paddle shift, you move up to 6th gear, but when your speeds and revs drop, the gear indicator on the instrument panel between the clocks does not change. Instead it stays stuck indicating 6th gear though when you drop the accelerator pedal from 40kmph, and you can feel the shift and see the revs climb and drop at each gear shift. 12. 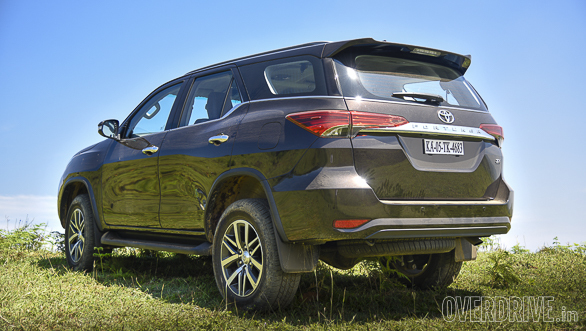 I haven't spoken about the Fortuner's styling yet though which is something that isn't going to be missed by a mile. I like it and I don't like it. The new Fortuner appears to have shaved off its day-old stubble, to be replaced by a groomed, exfoliated and bronzed appearance that immediately screams upmarket, expensive and rich! And that to me is the root cause of some issues I fear the Fortuner will face. In its previous avatar, owners had no compulsions about taking the Fortuner into any conditions in any circumstances. Now it looks too pretty to be foraging its way through dense undergrowth or across frozen hills. I'd hate to put a scratch anywhere on those panels and that, I believe, is also how a lot of customers are going to treat her. 13. I like the dashboard and its shallow depth concept. This isn't a big and large unit and that means two things - one it improves interior space and second it throws a smaller reflection on the windscreen. I'm quite surprised to see the interior packaging which is again very upmarket in feel compared to what it used to be. This also fortifies my opinion that consumers aren't going to use the Fortuner in tough conditions, despite Toyota claiming that the Fortuner is tougher than they could imagine. 14. The seats are large, thick and comfortable, not very supportive but then again they are quite firm for both short commutes and long-distance trips. The driver-side seat is electronically adjustable with electronic height adjustment as well; however, the passenger side has manual adjustments sans a height adjuster. And this is a bit bothersome because at 5'9" my head was just about 3-4 few inches away from the headliner which could be harmful in off-road conditions. For anyone 6 feet and above, this could be a bit of an issue both as a front- or middle-row passenger. This is because the roof has a slightly tapered to the rear profile to it unlike the previous-gen vehicle which had a more flat and horizontal profile. The middle bench can be adjusted for reach, and this helps the third-row passengers get a bit more knee room, though the space is best for children or shorter people. The middle bench has a 60:40 split, and the third-row similar to its predecessor can be folded and hinged to the sides. 15. A unique feature of the new Fortuner that must be mentioned here is the tailgate opening mechanism that has a memory function. It's electronically activated, but people of varying height can adjust that height to their choosing. It has also got a built-in safety mechanism which will prevent the tailgate from closing onto anybody. 16. Toyota is committed to safety in a big way, with all its cars now offering ABS and airbags as standard. In the Fortuner, you get seven airbags, ABS with EBD, child restraint system with ISOFIX, hill assist and downhill assist, and several active and passive safety systems. 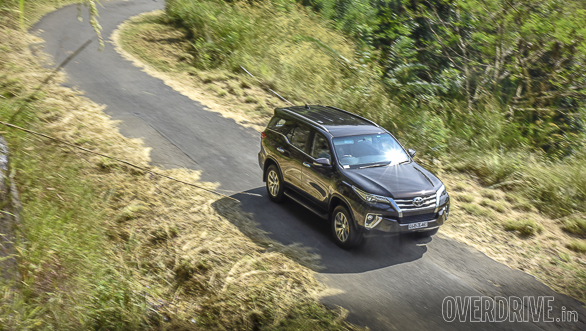 Overall, then the new Fortuner builds on all the things the previous-gen SUV did without really doing anything revolutionarily new. It quite simply takes on the older formula, scrubs it down thoroughly, cleans up all the loose ends and then throws in a fantastic new coat for good measure. It is plusher and more luxurious, and that is probably one of the aspects that many consumers will find appealing. Not to mention its price. We were expecting a higher price tag, but Toyota has surprised us all. 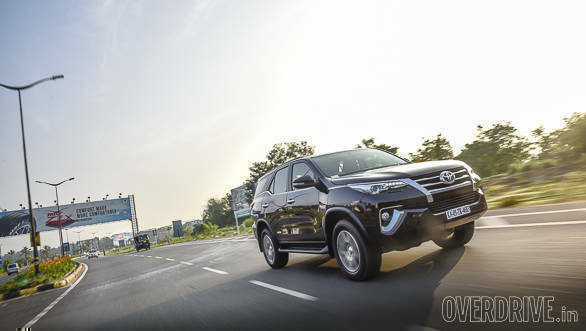 Clearly, the Fortuner is back in the game for the long haul!